In what is being seen as a tough competition to Paytm, tech giant Google has announced Tez – a mobile app for digital payments and commerce. Built on the Indian government-supported Unified Payments Interface, the app allows users to do financial transactions like sending money, receiving payments directly into their bank accounts and paying bills. The users can link the app to their bank accounts. The app was built for India, working on the vast majority of the country’s smartphones and available in English and seven Indian languages (Hindi, Bengali, Gujrati, Kannada, Marathi, Tamil, and Telugu). The app is available now for download on Google Play (Android) and the App Store (iOS). 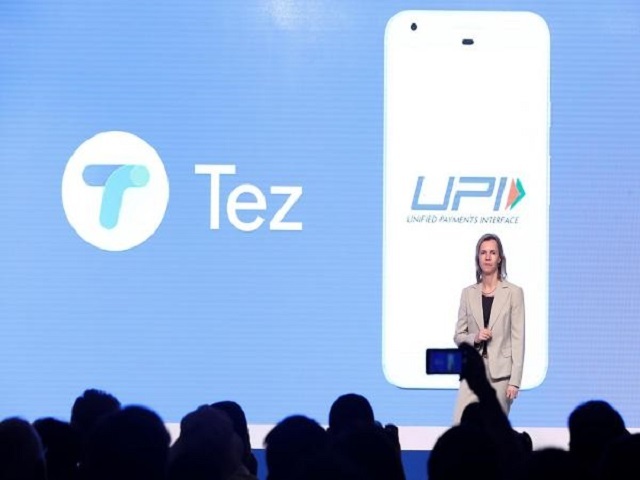 Tez works in partnership with four Banks — Axis Bank, HDFC Bank, ICICI Bank, and State Bank of India (SBI) — to facilitate the processing of payments across over 50 UPI enabled banks. Simple transactions on the spot: Tez’s Cash Mode securely sends money from person to person with just a few taps. By pressing and holding the Cash Mode buttons at the same time, two people using Tez are able to make a secure transaction in seconds without needing to share private details like phone numbers or account numbers. This happens through Google’s proprietary Audio QR (AQR) ultrasound technology . Best of all, recipients get the amount deposited to their bank account instantly. Pay anyone: Tez syncs with the contact list in users’ phones, in accordance with their privacy settings. This way users can start a transaction just by searching for a friend’s name or phone number. Once a contact is on Tez, users do not have to add beneficiaries or enter bank account number and IFSC codes. If the other person is not on Tez or in the phone contact list, then users can still pay them with their bank account number or UPI ID. Transaction history with each person is grouped together like a conversation — just like how Gmail groups emails together. This makes it easier to find a particular transaction, instead of going through long statements. Pay at offline and online businesses and get offers: Tez is accepted anywhere that UPI is accepted – even shopping at the corner store or buying online. When users shop at a Tez for Business merchant (see more details below) they get access to tailored offers and smart reminders for upcoming payments. An integration with Chrome makes mobile web payments just like paying in an app, and users can quickly get to a business’s website or contact customer support, right from Tez so they don’t need install an app for every business they engage with. Integrated with bank accounts: Tez is not a digital wallet requiring constant top up. It works with all 50+ UPI-enabled banks, so that money stays in users’ bank accounts until they need to use it. Tez users continue to earn interest from their banks and have their deposits backed by bank security guarantees. There is no need to reload a digital wallet. Multiple security layers: Tez is backed by multiple security levels, including dedicated security systems offered by Indian banks, the NPCI, and the Tez Shield — Google’s suite of security features, including a machine-learning-based fraud detection engine, device level protection, including a Google PIN, and no sharing of phone numbers or bank account numbers via Cash Mode. Customer service is available 24/7. Built for India first: Tez works on the vast majority of smartphones on both Android and iOS, in English and Hindi. The Android version is available in additional Indian languages: Bengali, Tamil, Marathi, Telugu, Kannada, and Gujarati. Tez Scratch Cards™ and Tez Lucky Sundays™: With each eligible transaction, Tez users have the opportunity to win Tez Scratch Cards™ worth up to ₹1,000 and get enrolled for the weekly Lucky Sundays draw of Rs 1 lakh. No need to hunt for coupon codes: When a Tez user wins, as per applicable terms and conditions, rewards go straight into the user’s bank account.